"How to Improve Profit Margin in Food and Beverage Industry"
Much like a well-prepared dish, when it comes to software, the right ingredients make all the difference. The food and beverage industry deals with narrow operating margins, rapidly changing customer preferences, and highly perishable items on a daily basis. Although current supply chain management (SCM) tools provide food and beverage executives more visibility to help them quickly help their companies adapt to changing conditions, today’s globally competitive market demands an even fresher, more innovative approach. 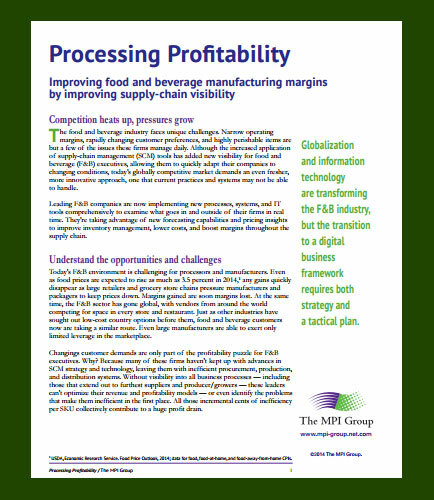 What are the market trends and strategies in the food & beverage manufacturing business? How can the effective use of SCM tools help in the management of food and beverage industries? What are the most common challenges faced by the food and beverage industries in managing food and beverage supply chain? Read this whitepaper to learn how modern supply chain management systems, business analytics and IT tools can help transform today’s food and beverage industry business challenges into opportunities.